Today’s roofing systems are made of more than just the outer metal, slate or asphalt. It’s a system of several parts that protects your home against the elements, while maintaining indoor comfort. Read on as Chase Roofing LLC discusses the major parts of today’s residential roofing systems. The roof frame is the skeleton of the roofing system. It’s made of several components, including the trusses, the rafters and the ridge beam, all of which form the parts where the decking will be attached. The roofing slope, shape and type of material are decided by the roof frame. Also known as the roof deck or substrate, the decking material is typically made of plywood or oriented strand board. It is attached to the rafters using nails. The decking material has to be allowed to adjust to the local moisture levels to avoid substrate movement, which results in premature buckling or cracking. For most roofing replacement projects, the old roofing is stripped down to the roof deck. Foam insulation is installed on the interior side of the roof deck after completion. 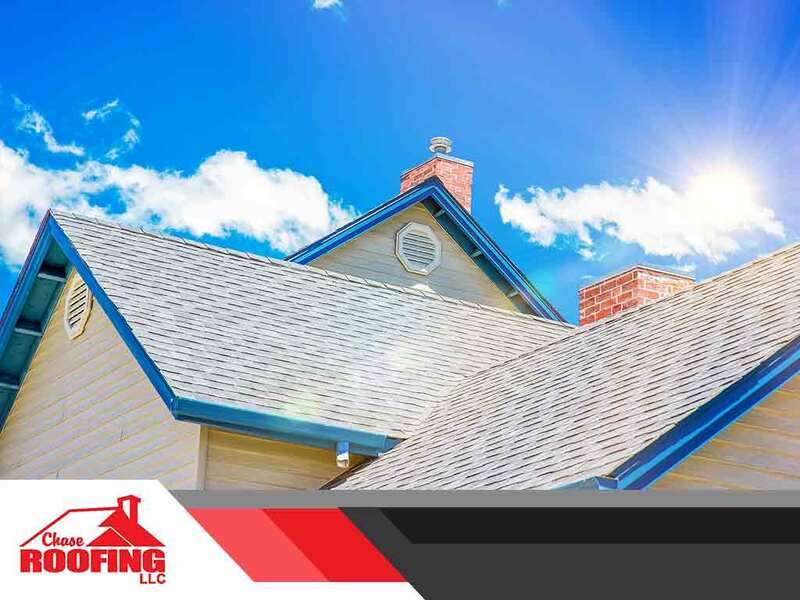 Roofing replacement projects typically start by installing the underlayment, which is sometimes referred to as roofing felts. It is the waterproofing layer that acts as the secondary line of defense in case the outer roofing layer is breached. Traditional asphalt-saturated felts are rarely in use now, with synthetic materials such as the GAF Deck-Armor™ being widely used thanks to its evaporative properties. Breaks and valleys are reinforced with waterproofing barriers with adhesive. The roof edge is vulnerable to wind damage, and therefore needs to be as close to monolithic as possible. This is why manufacturers such as GAF have made starter strips, which are composed of the same material as the rest of the roof but from a single piece. They are also reinforced with special adhesives. Proper ventilation is essential to keeping heat and moisture out of the attic. Trapped heat and moisture can damage the decking, insulation and roof frame, as well as cause ice dams during winter. This is why modern roofs now have ridge vents. As the heat is vented at the top, the resulting air pressure pulls fresh, cool air from the eaves. Chase Roofing LLC is a GAF Master Elite® roofer who can answer your questions about roofing. Call us today at (757) 333-0052. You can also fill out our contact form to schedule a free, no-obligation quote. We serve Williamsburg, VA, and the surrounding areas.